On 6 March 2018, Selangor Information Technology and E-Commerce Council (SITEC) organised its first Chinese-language e-commerce class on the e-Tail process, Mobile Commerce and Understanding O2O, to an audience of 80.The class was led by Coach Goh Boon Peng, Director of SITEC Academy, and featured guest speaker Ang Kok Gei, Managing Director of ATKC Warehouse. Coach Goh started the session with anecdotes of his previous e-commerce work experience in Taipei. According to him, the e-commerce scene in Taiwan began circa 1999. His first stint selling mobile phones online followed a business model where the company secured their stock at lower prices and resold them online. They disrupted the mobile phone retail market through a combination of online discounts and offering the flexibility of picking up their purchases at various locations. 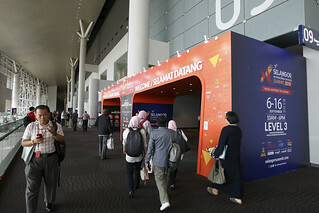 Back home, Goh observed that the first wave of Malaysia’s e-commerce trend was actually started by AirAsia, particularly when consumers felt safe enough to purchase air tickets online. The second wave was initiated by Groupon, which attracted consumers to order discount vouchers for dining and other services. “Malaysian consumers actually triggered both e-commerce waves, for it did not involve logistics. You buy air tickets and coupons online, and print them out,” Goh added. 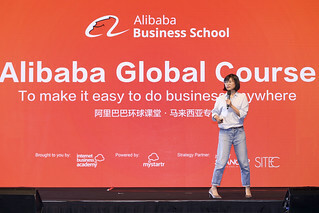 Citing the example of a company making 100 million in revenue by selling shoes online, Goh pointed out that stock keeping unit (SKU) was the key to success. Goh also observed that the local and foreign e-commerce scenes were rather stagnant at the turn of the century and several years after, for no major players were strong enough to create new trends. In his words, that was the ‘low entry point and less competition era’ of e-commerce. That was also when Goh and his friends founded a company selling shopping cards. The business lasted for several years but the experience was precious enough for him to re-adapt and redevelop relevant skills to put to good use on the online sales platform of his previous employer, Purple Cane. He also brought that experience and knowledge to his startup, a crowfunding site called Mystartr, as well as to SITEC to promote e-commerce. These days, the e-Commerce scene is a different beast. Boasting low entry points, its tradeoff is stiff competition and market saturation, making it difficult achieve breakthroughs. Potential players are also worried if they it’s too late to jump on the bandwagon. 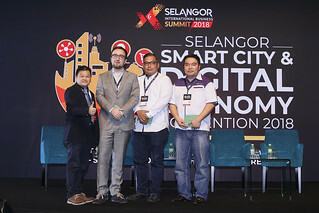 Goh advised that that starting sooner rather than later is better, for the prospects are still relatively good for Malaysia’s e-commerce industry. Smaller companies enjoy greater flexibility in running their business – an advantage when compared to bigger companies where longer processes and office politics can be a hindrance to decision making. Clear messaging to target audiences is essential to breaking through the e-commerce industry. There are three aspects to clear messaging: copy-writing, photography, and audio-visual presentation. Businesses can also increase consumer confidence, an important aspect, through quality business content, products and services, and the reliability of payment systems. Goh suggested that new e-commerce companies start selling on bigger platforms such as Lazada, 11Street, Youbeli, Shopee, LogOn, Mudah and others. Guest speaker of the day was Ang Kok Gei from ATKC Warehouse, a company based in Selangor. Being in the business for years, the warehouse mainly serves customers in the Klang Valley. An encouraging factor in Ang’s expansion plans was the strong support from customers. “We had two choices back then. It was either we start a new branch or we explore e-commerce. We did not want to be limited by location, so we opted to expand online. Understandably, when you mention a warehouse, others would think of numerous items of various sizes and dimensions. Bigger items might be lightweight while smaller items could be very heavy, so every product is different,” said Ang. Uploading pictures online was a challenge. In the early days of the online venture, Ang personally took the trouble to key in product details, passing the skill on to his colleagues after mastering it. Fast forward to today, ATKC Warehouse currently has eight e-Commerce executives. Its sales skyrocketed from RM 140,000 to over a million ringgit from 2014 to 2016, and the ratio of online to offline sales increased from 3:97 to 8:92. “To run an online business, you need to have attractive product photos, honest descriptions of the products, and reasonable prices. I think that e-commerce companies have to do what they know best, so that they are confident enough to start.”, he added. Managing his online shop for several years, Ang said that items displayed on the website do not necessarily reflect stocks kept in their warehouse, although he was confident that he could deliver the goods on time. Given the huge number of products, Ang opined that they should focus on the management of stock-keeping and accounting systems to run the warehouse e-commerce business in a tidy manner. Aside from possessing its own delivery fleet, AKTC also works with several courier companies. He encouraged potential e-commerce businesses to consider three markets: local, regional and global. In other words, the Asia-Pacific region of 28 countries and territories is a massive potential market. Don't miss our events anymore. Subscribe to our mailing list now to receive the latest news and updates from our team! You have successfully subscribed! In order to receive our notifications, do check your inbox for a confirmation email! We take your personal information seriously. Your information is safe and protected with us as per the Personal Data Protection Act 2010. Check out our Co-working Space! We don't want you to miss out. Be the first to get up-to-date news, updates, promotions, and even exclusive invites when you subscribe to our FREE newsletter! SUCCESS! Now sit back, relax and enjoy our site!